I’m finally reading through Sheed and Ward’s Saints are Not Sad (1949), a collection of hagiographic portraits by some of Catholic England’s most notable authors of the last century. Just recently, I finished Fr. Vincent McNabb’s chapter on St. Columbanus, the Irish missionary-monk and founder of Italy’s Bobbio Abbey, a bulwark against Arianism and a benchmark of orthodoxy for centuries. 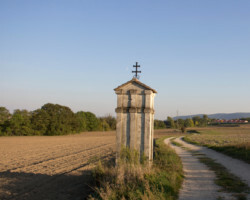 The saint’s life story is a fascinating one, but I was especially diverted to discover his connections with the Easter controversy – that knotty calendrical conundrum concerning how Christians should calculate the date we commemorate the Resurrection every year. Unlike Christmas, which is a fixed date that can fall on any day of the week, Easter has always been observed on a Sunday – at least since the fourth century when the Council of Nicaea made it mandatory. But which Sunday was to be the Easter Sunday each year was left up for grabs, and Christians have been divided over the question ever since – especially Christians East and West. Catholics and virtually all Protestant denominations follow one method for determining the date of Easter, and most of the Orthodox world follows another. Rarely do our Easter celebrations coincide – an ecumenical blight that is not likely to be repaired any time soon. But even the West was divided on the Easter question for many centuries. By Columbanus’ day, the bulk of the Catholic world followed a Roman calculation, which disregarded Jewish Passover reckonings, yet, until the late seventh century, British and Irish Christians followed an older, possibly more Hebraic formulation – a formulation that St. Columbanus vigorously defended. “Little is known of how the British and Irish Churches computed their Easter,” writes McNabb. “Only one thing is quite certain, that they kept the Easter as first taught them by Rome” – that is, they refused to follow what was then the fashion in Rome because they were dedicated to the tradition that they’d received from Rome many centuries before that. And when the British churches started caving to the contemporary majority Roman usage, the Irish churches stubbornly clung to what they saw as the preeminent and more ancient Apostolic practice. Such a Romish kerfuffle could only be sorted out by a Roman Pontiff, and that’s exactly what happened. Elected in 657, Pope St. Vitalian had to grapple with various heresies and rambunctious autocrats, but perhaps his crowning achievement was shepherding a resolution of the Easter question, along with other disputes between Rome and Ireland, thus bringing the Celtic churches completely into the Catholic fold. In this, St. Vitalian demonstrated what for me, while still a Catholic wannabe, was so attractive about the papacy – that is, why we need it and how it works. “The Roman Pontiff, as the successor of Peter, is the perpetual and visible principle and foundation of unity of both the bishops and of the faithful,” reads Lumen Gentium (§23) – specifically, the bishops and faithful already in union with the successor of Peter himself. We don’t need a CEO of the whole world – or even of all Christians. What we need – what Christ provided us – is a supreme pastor and final arbiter who’ll settle our own in-house disputes first and keep the family together. And that’s what Pope Vitalian did. Maybe the rest of Christendom went on doing their own thing when it came to Easter – a tragedy, to be sure. Yet what was essential, at least for the Papa, was that all his own flock came around to celebrating the feast together every year. With God’s help, he pulled it off in the end, and we universally rejoice in his triumph each spring. Alleluia! Vitalian died in 672 on January 27 (his feast day), and he is buried in St. Peter’s Basilica.